I guess I stand corrected regarding the maj. A, though I'd be interested in seeing the original manuscript that that type is based on for the "truth". The majority of what I've looked at has the inverse of what they've done: the more open bottomed version for the maj. (what I referred to as folding back on itself), and the closed bowl for the min. Granted, I had to scroll past a lot of uncial-like fonts on MyFonts to find that one. It seems to be a rare case. Good thing I'm not worried about historical accuracy! I guess I can try out an open-looped or triangular version for my third stylistic variant. Meanwhile, I've made the closed-loop /A a bit prettier, and tried my hand at /H/I/J. I found the /I particularly tricky. I made a one-sided and two-sided version of it. I believe the one-sided one is more historically relevant, but I find it rather unattractive and very /J-like. On the other hand, the half overlaps in the symmetric /I stand out from the rest of the font. What to do...? Here are a few examples from my collection of photographs of hands in the collections of the Museum Meermanno and of the Royal Library, both in The Hague (so, not the original manuscript for that type). Unfortunately, the catalog of the RB is in one of many boxes, because my library is moved to the new DTL Studio. 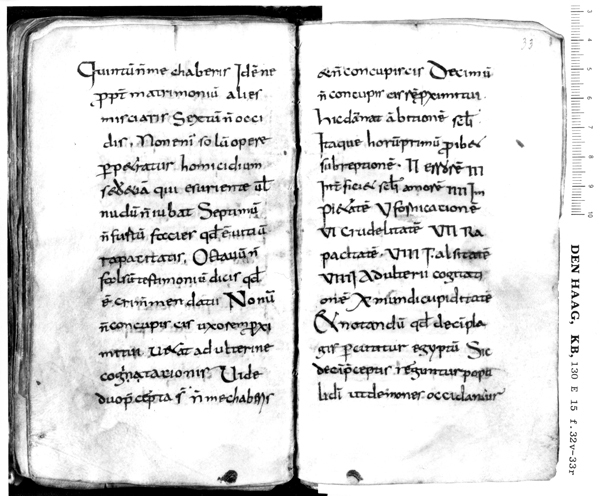 I guess that the following two pages are from the end of the eighth century or early ninth century (but I will provide you with the exact details later). I've completed a first set of capitals for the base version of the typeface. There's a few letters I'm not happy with yet, in particular /V/Y, and maybe /L. Any suggestions...? I'm reviving this thread since I happen to have two new project ideas on my hands once more, and only time for one of them... OK, to be fair, I have time for neither, but still. One project is based on my amateurish brush pen experiments with a casual light blackletter. I'm not sure whether there's any use for such a thing at all, but I like the looks of it. 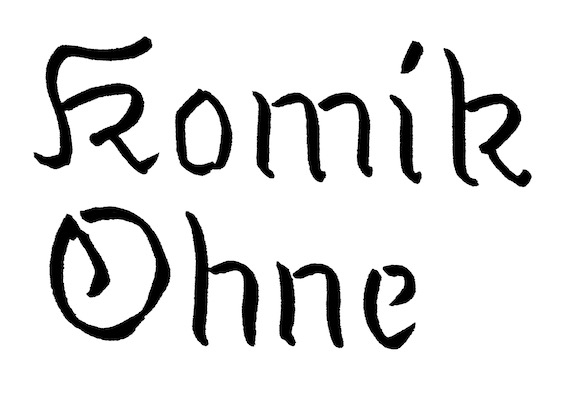 I'm thinking of eventually handing it out for free and marketing it as Komik Ohne, the fraktur counterpart to Comic Sans. Given the meme power of Comic Sans, I'm hoping there might be some PR potential in that. The other is another geometric blackletter constructed from a hexagonal aesthetic. Not very legible, but I guess it would work well for beer labels. Any of these seem promising? As these seem two new projects, it might be better to start a new thread. Else you'd get comments such as "I like the top one better - the one in your original post". For me its nice to see that uncials attract the attention of a fellow designer; I had a lot of fun with them. They actually do generate some revenue, as a matter of fact. 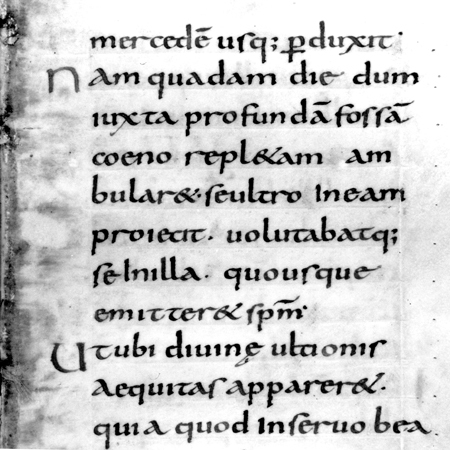 I would randomly mix Irish (insular) and continental uncial forms only when you’re absolutely sure about what you’re doing. I'm too late, but: Kensai all the way. And there's nothing fake about cultural cross-pollination. A warning about the dangers of monoculture in the form of a person quoting himself quoting himself! I think you’d develop more from the less geometric option. Monoculture is thinking that having one writing system be inspired by another is fake. The fauxtrage of "cultural appropriation" is a facile way to feel virtuous. Through a convenient formalization of Authenticity, Western savior complex stunts non-Latin scripts, which comes back to stunt Latin. Turicum might very well sell better than Kensai, but to me seems far less culturally enriching. 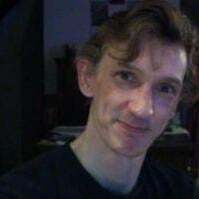 Theunis: Well predicted, the thread was derailed (re-railed?) immediately. I'll start a new thread for Komik Ohne, then. Andreas: I absolutely do not know my history. 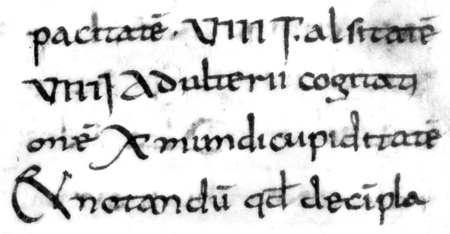 With Turicum (and my pseudo-uncial handwriting in general), I'm just trying to put things together that look nice together and that work in the extremely cramped quarters of the x-height. I'll have to find another solution for /g, at any rate. Hrant: I believe Craig mentioned «monoculture» in the context of my already having a geometric blackletter in my portfolio. I've long given up on Kensai. @Christian Thalmann That's not how I read his comment; but I could be wrong. Maybe Kensai stopped making sense to you. But please don't give up on cultures being more than roommates who don't talk.